Woo! It is June, and you know what that means: Bloggiesta! In case you don’t know what Bloggiesta is all about, it is basically a blogging marathon organized by Natasha at Maw Books Blog. I have a LOT to get done around here in preparation for Audiobook Week, so this is good timing for me! Other than some email I need to respond to, the main things I am planning are to write as many posts as possible for the next two weeks and finish up some Audiobook Week planning (which I’ll HAVE to do if I’m going to write posts for it!). When I need a break from writing I’ll be working on my overhaul of my categories and tags. I do have some design elements I want to improve upon, but I think I need to finish my Audiobook Week stuff before I can even think about that, since we also have some big family stuff coming up soon (my parents are coming out for the summer, Daniel’s first birthday). I may also check in on the mini challenges this time around, but they are not going to be my priority. 9 comments to Bloggiesta, Take 3! Just stopping by from the long list at Maw Book’s Bloggiesta party. You signed up right before me so I thought I should come say hola! Good luck getting audio week up and running and for a successful blogging weekend. Good luck with all you goals! I can’t wait to come back and check in with you. Have a good weekend. Wow 1 year old already! Time flies doesn’t it? Good luck, hope you make some good progress on your to-do list. Here’s to a productive weekend! I’m looking forward to Audiobook Week and to hearing about Daniel’s first birthday party — have fun! Your blog always looks so neat and organized! Here’s to a productive weekend! 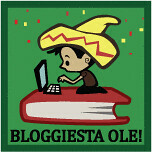 It’s my first time participating in Bloggiesta. I have quite a list of things to do, but even if I only cross of a few items, I will still be happy (less things to think about!). Have a great weekend!